LANSING (AUG. 1, 2018) — In the final days before Michigan’s primary election, the most active TV advertiser in races for the state Legislature is a nonprofit organization that’s linked to the state’s largest energy provider. The group, Citizens for Energizing Michigan’s Economy, doesn’t have to disclose where its money is coming from or how much it’s spending in individual races. Its actions are drawing criticism from opponents who are concerned about its influence, the sources of its funds and the general nature of the advertisements. “Even people who are not targets who are witnessing what they’re doing are not happy,” said state Rep. Gary Glenn, a Republican from Williams Township who chairs the House Energy Committee and has been a critic of the state’s large utilities. Glenn, who is running for the state Senate this year, has been the subject of attacks from a separate nonprofit organization. 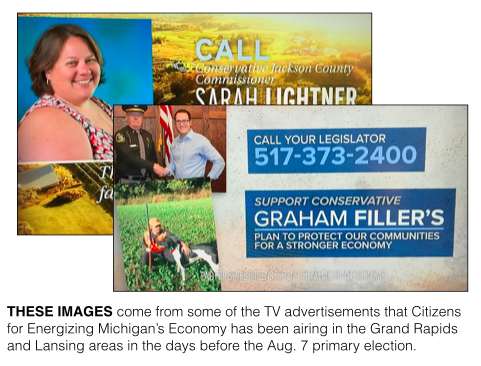 In five other primary races for either the Michigan House or the Michigan Senate, Citizens for Energizing Michigan’s Economy has sponsored broadcast TV ads promoting one of the candidates. In a sixth race, the group has aired radio ads. Usually, broadcast TV ads touting candidates for the Legislature are rare in the run-up to the primary election. But an analysis of ad-tracking data from Kantar Media/CMAG shows that Citizens for Energizing Michigan’s Economy aired an estimated $162,000 in broadcast TV ads in the week from July 24 through July 30. More ads are schedule to run in the final days before the primary election, according to filings with the Federal Communications Commossion. The nonprofit organization emerged in 2013, using the address of a law office in Okemos. The group once focused its efforts on encouraging public opposition to a legislative proposal to expand the the state’s electric choice program, which limits how many customers can get their electricity from alternative suppliers. A spokesperson for Jackson-based Consumers Energy acknowledged to MLive in 2014 that the utility was using shareholder dollars — not customer dollars — to support Citizens for Energizing for Michigan’s Economy at the time. In 2017, Consumers Energy reported spending $20 million on contributions to Citizens for Energizing Michigan’s Economy, according to a filing with the Michigan Public Service Commission. Representatives for the nonprofit didn’t comment on this story. Its board has featured two former Consumers Energy employees, according to a filing with the state of Michigan. This May, the nonprofit began airing radio advertisements in the Lansing area touting state Rep. Brett Roberts, a Republican from Eaton Township who is currently in a competitive primary race for the Michigan Senate against state Rep. Tom Barrett, a Republican from Potterville. The broadcast TV ads promoting five other candidates began airing in the Lansing area and Grand Rapids area on July 24. The ads make a variety of positive statements about former Rep Mike Callton, a Republican from Nashville, former Rep. Aric Nesbitt, a Republican from Lawton, current Rep. David Maturen, a Republican from Vicksburg, Sarah Lightner, a Republican running in the Jackson-area 65th House District, and Graham Filler, a Republican running in the DeWitt-area 93rd District. Callton is in a competitive primary race in the 19th Senate District, and Nesbitt is in a competitive primary race in the 26th Senate District. Maturen is facing a primary challenger as he seeks re-election to his 63rd District seat in the state House. The ads in each race are different, and they touch on a variety of subjects. For instance, the ads promoting Maturen focus on his position against so-called “government handouts.” They also feature images of President Donald Trump. “Call conservative state Rep. David Maturen and thank him for his vote to keep making Michigan great again,” the ads about Maturen said. The ads about Nesbitt tell viewers to call their lawmakers and to tell them to support Nesbitt’s plan to help family farmers. “Aric Nesbitt knows that good roads are needed if you want to move crops to market on time,” the ads say. The messages are examples of so-called issue ads, which focus on issues and don’t expressly tell people how to vote so they don’t necessarily fall under Michigan’s campaign finance regulations or disclosure requirements. Nesbitt, the former House Energy Policy chair, Callton, Roberts and Maturen voted in favor of a re-write of Michigan energy laws in 2016 that was supported by the state’s largest utilities. The primary opponents of Callton and Roberts voted against the 2016 re-write. They are Reps. John Bizon, a Republican from Battle Creek, who is running against Callton, and Rep. Tom Barrett, a Republican from Potterville. The advertising outburst has already led to a complaint with the Internal Revenue Service, which regulates nonprofit organizations. Economist Patrick Anderson, whose wife, Madhu Anderson is running against Filler in the 93rd District primary, filed a complaint this week against Citizens for Energizing Michigan’s Economy, he said. Anderson said the actions of the nonprofit are a “serious threat” to the campaign finance system because the nonprofit organization is taking in money from anonymous donors and using the money to fund ads that aren’t truly issue focused. “This is now the dominant player in primary campaigns in mid-Michigan,” Anderson said. In recent years, the IRS has taken a somewhat lax view when it comes to the regulation of social welfare organizations, like Citizens for Energizing Michigan’s Economy, which have been allowed to spend on political advertising, as long as campaigning isn’t the groups’ primary focus. Another nonprofit, Faithful Conservatives for Michigan, has been targeting Glenn, the current House Energy chair and an outspoken supporter of expanding electric choice, in his race for the state Senate this summer. As of Monday, July 30, the group had already spent an estimated $221,000 on broadcast TV ads either promoting Glenn’s primary opponent, former state Rep. Kevin Daley, a Republican from Lum, or slamming Glenn. The anti-Glenn ads compare Glenn to a snake. The group has also aired radio advertisements and sent out mailers. Glenn believes utilities are behind the ads against him. He points to the fact that Citizens for Energizing Michigan’s Economy reserved ad time on an AM radio station in his area in mid-April. The group canceled the order. Later in the month, Faithful Conservatives for Michigan began reserving time on radio, cable TV and broadcast TV in Glenn’s area. 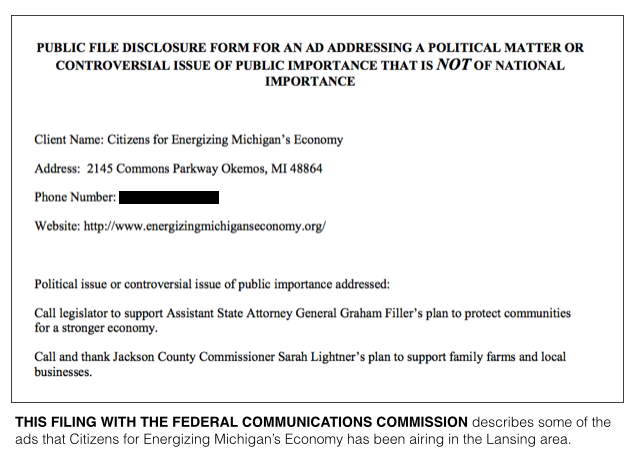 State Rep. John Reilly, a Republican from Oakland, filed a complaint with the Michigan Bureau of Elections about the Faithful Conservatives ads, saying they weren’t issue ads but “political attacks.” The complaint asked the bureau to conduct an investigation and refer to the matter to the state’s attorney general and the IRS. 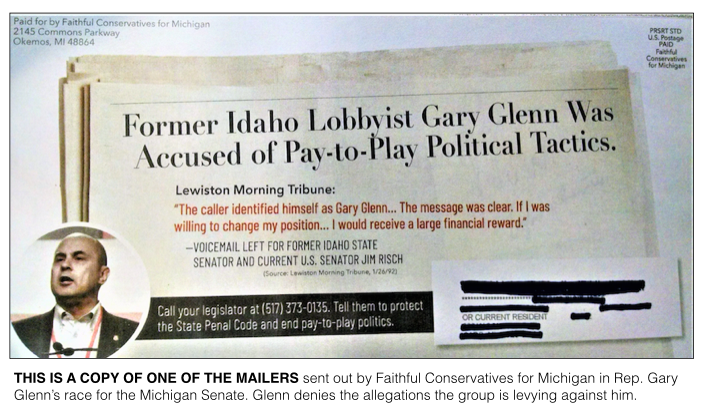 “… Faithful Conservatives for Michigan’s behavior was totally insensible from the perspective of an issue advocacy group, but completely logical for a group electioneering for Kevin Daley against Gary Glen,” Reilly wrote in his complaint.